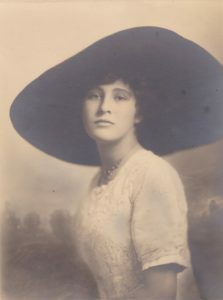 On June 9, 1930, a Junior Service League was organized in El Paso by twelve women: Mrs. Behr Waters, Mrs. Preston Perrenot, Mrs. Tom Mayfield, Mrs. Bryan Brown, Mrs. Jess Boykin, Mrs. H.A. Borders, Mrs. Louis Scott, Mrs. Britton Davis, Mrs. Warren Pilcher, Miss Marion Ainsa, Miss Ruth Rawlings, and Miss Patricia Ainsa. Eighty charter members were invited to join the League in September of the same year. The Junior League of El Paso was then founded in 1933 with the essential aim of training members for effective participation in the community through a program of education and volunteer service. The newly-formed League embarked upon an innovative project, the Social Service Exchange, whose goal was to improve the operation of existing social service agencies in the city. From its inception, the League supported the arts enthusiastically, and in 1939-1940, the League sponsored the first Young People’s Symphony Concert. Ways and Means projects were: $5.00 personal assessment, profit on tickets to various civic functions, sale of Easter eggs, and a fashion show. The League financed the Depression years by volunteering personal monetary assessments in order to avoid solicitation of funds from the general public. 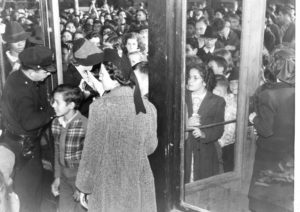 League members also worked at the Popular and White House department stores and as case workers for social service agencies. Their salaries were then donated to the League’s welfare fund. In addition, the League operated rummage sales, a costume rental bureau and a circulating library. But, probably the most enjoyable fund-raiser was the “Junior League Follies Revue,” which was staged and directed by a Hollywood producer/director. The 1935-1936 Follies brought in $3,329.62. Mrs. James H. Polk of the El paso League Instructs William Beaumont patients how to weave, as part of their rehabilitation. 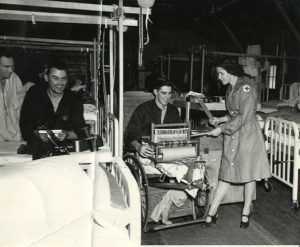 The outbreak of World War II in 1941 brought greater demands upon all El Paso citizens, and the League was spurred-on towards additional volunteer efforts so vital to the wartime work of the Volunteer Service Bureau. Realizing that world-peace could not become a reality unless our children were given a chance to develop and grow, the League focused its community commitment on the physical, cultural and mental growth of El Paso’s youth. 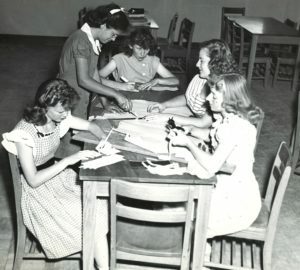 The Goodwill Girl’s Club, established in 1943, arose out of a wartime need for a recreational program for teenage girls. This early effort resulted in an on-going, citywide recreational program with the City of El Paso and the public school system. Girls at Austin High School designing and hand-tooling leather sandals, bill folds, purses and other items. was realized- a live theatre program was created for children in the elementary schools.